This product blew me away. I have tried so many different cuticle removers both professional and consumer grade - but NEVER experienced the beautiful results like this product delivers. Made especially for the nail professional, this product quickly, gently and effectively dissolves dead skin (cuticle) for easy removal from the nail plate. Quite simply, this product makes your job as a nail tech MUCH EASIER, and the clients get a top-notch manicure as a result! Gently spread a pearl size amount onto each nail and wait about 1 minute. The Sodium Hydroxide quickly loosens the ugly cuticle plaque build-up on nails making removal a breeze. The aloe counteracts the drying effect of Sodium Hydroxide, but it is also very important to the products neutralize with soap and water. This amazing gel-serum can also be used to break down tough calluses during pedicures. 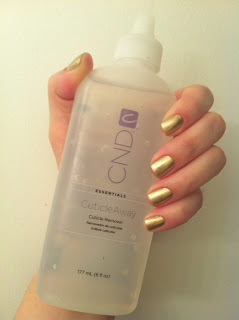 Check out this video on a natural nails manicure using CND CuticleAway.